Background: The association between serum level of 25 hydroxy vitamin D (25 (OH)D) and serum uric acid (SUA) among non-diabetic chronic kidney disease (CKD) has not been reported so far. Objective: We aimed to study the association of serum 25 (OH)D with SUA among stage 3a-5 CKD patients with and without diabetes mellitus (DM). Cases and Methods: we studied 527 (234 male and 293 female) diabetic (group 1) and 1197 (611 female and 586 male) nondiabetic (group 2) CKD patients. A blood sample was drawn to estimate eGFR, SUA, serum calcium (Ca), phosphorus (P), albumin (Alb), parathormone (PTH), and 25(OH)D. Fasting blood sugar (FBS) and fasting insulin (FI) levels were used to calculate Homeostatic Model Assessment of Insulin Resistance (Homa-IR) in group 2 patients. In addition, a morning urine sample was collected for estimation of urine albumin excretion (UAE). Results: There was no significant difference in SUA or 25 (OH) vit D between the 2 groups or between male and female patients. By univariate analysis, SUA significantly correlated with age, 25(OH) vit D, PTH, Ca, P and UAE (R= 0.05, -0.726, 0.54, -0.087, 0.166, and 0.736 respectively, P= 0.039 for age, and <0.001 in all other associations). Neither SUA nor 25(OH) vit D have significant association with Homa-IR in group 2. SUA was independently related to 25 (OH)D in multivariate linear regression analysis. Conclusion: Vitamin D deficiency is significantly associated with elevated SUA among stage 3a-5 CKD patients. Further studies are needed to confirm this finding and to disclose the underlying mechanism(s). CKD is associated with elevated SUA. High SUA offers higher risk of CKD progression. In addition, hyperuricemia is an independent risk factor for developing cardiovascular disease and for higher cardiovascular mortality. The possibility of a direct relationship between hyperuricemia and vitamin D metabolism was first raised 25-years ago. By that time, uric acid was incriminated to affect serum 1,25 (OH)2 vitamin D level. [9,10] The association between SUA and 25 (OH) vit D was first reported four years ago among elderly healthy Chinese women. A recent study of diabetic CKD patients reported the significant association of low level of vitamin D with low levels of SUA. In the present study, we tried to find out the association between the very prevalent low serum level of 25(OH) vit D and SUA among pre-dialysis CKD patients with and without DM looking if there are any differences between these subgroups. This study included 1724 (820 male and 904 female) stage 3a-5 CKD patients; 527 have DM (234 male and 293 female) (Group 1) and 1197 (586 male and 611 female) were not diabetic (Group 2). Patients that were kept on hypouricemic agents (including sodium glucose transporter-2 inhibitors in diabetic patients), native vitamin D or cinacalcet were excluded. A written consent was obtained from every patient and was followed by clinical examination and a blood sample was obtained after 6 hours fasting. Body mass index was calculated for every patient. Blood samples were used for estimation of blood urea nitrogen (BUN), eGFR, serum level of Ca, P, PTH, 25(OH)D, and SUA. eGFR was measured using MDRD equation. Intact PTH level was determined by enzyme-amplified sensitivity immunoassay (Roche Diagnostics, IN, USA). Serum 25 (OH) vit D was assessed Using HPLC. FBS and FI levels were estimated in patients of group 2 and were used to calculate Homa-IR. A morning urine sample was collected to estimate urine albumin/ creatinine ratio. Data analysis was done using microsoft computer statistics package. Different parameters were summarized as mean ± standard deviation. Comparison between the 2 subgroups was evaluated using Student’s t-test. Correlation coefficient between different parameters was performed. Multivariate linear regression analysis was used to determine the best predictors of serum uric acid within the 2 subgroups. Results are summarized in Tables 1 to 4 and Figures 1 and 2. Most of the patients in the 2 groups were in stage 4 with about 17% in stage 3 and around 5% in stage 5 [Table 1]. Apart from slight difference in eGFR, there was no significant difference in any of the measured parameters between the 2 groups [Table 2]. 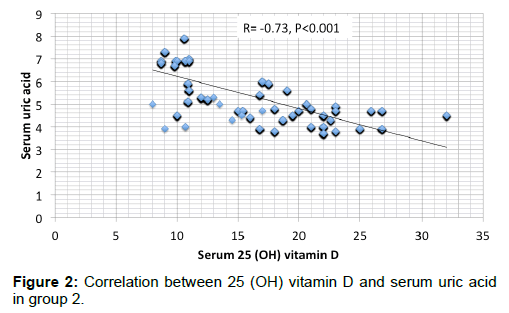 SUA had significant negative correlation with serum 25 (OH) vit D in either of the 2 groups [Figures 1 and 2]. In addition, SUA showed significant positive correlation with age, serum PTH and UAE and negative correlation with Ca [Table 3]. By multivariate linear regression and relative weights analyses, the best determinant of SUA is the seum 25 (OH) vit D in both groups [Table 4]. Figure 1: Correlation between 25 (OH) vitamin D and serum uric acid in group 1. 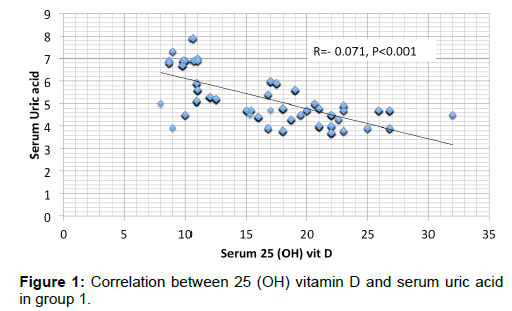 Figure 2: Correlation between 25 (OH) vitamin D and serum uric acid in group 2. Table 1: CKD stages in the 2 groups. Age (years) 19 - 66 33.6 ± 10.6 18 - 66 32.4± 10.18 N.S. BMI (Kg/m2) 17.5 - 30 23.5 ± 2.76 17.5 - 30 23.5 ± 2.72 N.S. BUN (mg/dL) 12 - 42 22.8 ± 4.78 10 - 42 22.8 ± 4.58 N.S. S.creat (mg/dL) 1.9 - 4.3 3.1 ± 0.57 1.9 - 4.3 2.9 ± 0.57 N.S. S.Albumin (gm/dL) 3 - 3.8 3.5 ± 0.13 3 - 3.8 3.5 ± 0.13 N.S. S. Calcium (mg/dL) 7.5 â 8.8 8 ± 0.28 7.5 â 8.8 8 ± 0.28 N.S. S.P. (mg/dL) 3.4 â 5.5 4.3 ± 0.65 3.4 â 5.5 4.3 ± 0.64 N.S. S. PTH (pg/mL) 44 â 98.3 76 ± 13.97 44.3 â 98.5 77 ± 14.1 N.S. S. 25 (OH)D (ng/ml) 8 - 32 17 ± 5.6 8 - 32 16.8 ± 5.9 N.S. SUA (mg/dL) 3.7 â 7.9 4.9 ± 1.06 3.7 â 7.9 4.9 ± 1.1 N.S. Urine ACR (mg/gm) 6.7-75 23 ± 19.78 6.8-70.8 22.4 ± 20.43 N.S. Table 2: Comparison between the 2 groups. Table 3: Univariate determinants of serum uric acid. Table 4: Multivariate predictors of uric acid. Homa IR showed significant positive association with P (r= 0.29, p<0.001) and negative association with Ca (r=-0.16, P<0.001) but failed to have any significant association with SUA, 25 (OH) vit D, or PTH [Table 5]. Table 5: Univariate determinants of Homa-IR in group 2. However, the only clinical trial that looked for impact of serum 25(OH) vit D on IR failed to demonstrate a significant association. In addition, genetic epidemiologic studies have failed to prove an association between UA and type 2 DM. [26,27] These results support our present findings. In addition to the present study, the significant association between SUA and PTH or P was previously reported in CKD children. The underlying mechanism of this significant association is still unclear and demands prospective studies. Taken together, these studies raise strongly the possibility of inhibition of hepatic 25 hydroxylation of vitamin D by the high SUA in patients with or without CKD. Another possibility might be through the recently discovered down regulation of the urate exporter, ATP-binding cassette transporter G2 (ABCG2), by PTH. ABCG2 is responsible for intestinal excretion of UA. PTH induced down regulation of ABCG2 might thus cause retention of UA. In other words, low 25 (OH) vit D stimulates PTH secretion that in turn causes UA retension. In the current study, the relative weight of 25 (OH) vit D in association with PTH versus UA criticizes this possibility. Finally, prospective studies are still needed to evaluate the role of UA in the pathophysiology of the mineral disorders, including the observed low 25 (OH) vit D among CKD patients. Professor Usama, Professor Mona Mansour, and Dr Ahmed Fyed suggested the hypothesis and objectives of this study, Dr. Dina collected the necessary literature, Dr Mahmoud El Nokeety, Dr Khaled Marzouk, and Dr Ahmed Heikal collected the study subjects, Dr Ahmed Fyed and Dr Hany Hammad collectd the samples and made the statistics, Dr Mervat calculated the Homa-IR, prof Usama wrote the manuscript, Dr Dina made the final revision. Thacher TD, Clarke BL. Vitamin D insufficiency. Mayo Clin Proc 2011;86:50-60. Al-Badr W, Martin KJ. Vitamin D and kidney disease. Clin J Am Soc Nephrol. 2008;3:1555-1560. Goncalves JG, De Braganca AC, Canale D, Shimizu MH, Sanches TR, Moyses RM, et al., Vitamin D deficiency aggravates chronic kidney disease progression after ischemic acute kidney injury. PLoS One. 2014;9:e107228. Ravani P, Malberti F, Tripepi G, Pecchini P, Cutrupi S, Pizzini P, et al., Vitamin D levels and patient outcome in chronic kidney disease. Kidney Int 2009;75:88-95. Wang L, Song Y, Manson JE, Pilz S, MÃ¤rz W, MichaÃ«lsson K, et al. Circulating 25-hydroxy-vitamin D and risk of cardiovascular disease: A meta-analysis of prospective studies. Circ. Cardiovasc. Qual. Outcomes. 2012;5:819-829. Yano H, Tamura Y, Kobayashi K, Tanemoto M, Uchida S. Uric acid transporter ABCG2 is increased in the intestine of the 5/6 nephrectomy rat model of chronic kidney disease. Clin Exp Nephrol. 2014;18:50-55. Jalal D, Chonchol M, Chen W, Targher G. Uric acid as a target of therapy in CKD. Am J Kidney Dis. 2013;61:134-146. Abeles AM. Hyperuricemia, gout, and cardiovascular disease: An update. Curr Rheumatol Rep. 2015;17:13. Hsu CH, Patel SR, Young EW, Vanholder R. Effects of purine derivatives on calcitriol metabolism in rats. Am J Physiol. 1991;260:F596-F601. Vanholder R, Patel S, Hsu CH. Effect of uric acid on plasma levels of 1,25(OH)2D in renal failure. J Am Soc Nephrol. 1993;4:1035-1038. Peng H, Li H, Li C, Chao X, Zhang Q, Zhang Y. Association between Vitamin D insufficiency and elevated serum uric acid among middle-aged and elderly Chinese Han Women. PLoS ONE 2013;8:e61159. Sipahi S, Acikgoz SB, Genc AB, Yildirim M, Solak Y, Tamer A. The association of vitamin D status and vitamin D replacement therapy with glycemic control, serum uric acid levels, and microalbuminuria in patients with type 2 diabetes and chronic kidney disease. Med Princ Pract. 2017;26:146-151. Levey AS, Bosch JP, Lewis JB, Greene T, Rogers N, Roth D. A more accurate method to estimate glomerular filtration rate from serum creatinine: A new prediction equation. Modification of Diet in Renal Disease Study Group. Ann Intern Med. 1999;130:461-470. Neyestani TR, Gharavi A, Kalayi A. Determination of serum 25-hydroxy cholecalciferol using high-performance liquid chromatography: A reliable tool for assessment of vitamin D status. nt J Vitam Nutr Res. 2007;77:341-346. Lai S, Coppola B, Dimko M, Galani A, Innico G, Frassetti N, et al., Vitamin D deficiency, insulin resistance, and ventricular hypertrophy in the early stages of chronic kidney disease. il. 2014;36:58-64. Teta D. Insulin resistance as a therapeutic target for chronic kidney disease. J Ren Nutr. 2015;25:226-229. Nakashima A, Yokoyama K, Yokoo T, Urashima M. Role of vitamin D in diabetes mellitus and chronic kidney disease. World J Diabetes. 2016;7:89-100. Spoto B, Pisano A, Zoccali C Insulin resistance in chronic kidney disease: A systematic review. Am J Physiol Renal Physiol. 2016;311:F1087-F1108. Dai H, Lu S, Tang X, Lu M, Chen R, Chen Z, et al., Combined association of serum uric acid and metabolic syndrome with chronic kidney disease in hypertensive patients. Kidney Blood Press Res. 2016;41:413-423. Ametov AS, Kochergina II, Ulanova KA. Effect of insulin therapy on insulin resistance and risk for ischemic heart disease and death from cardiovascular pathology in patients with diabetes mellitus, type 2. Ter Arkh. 2010;82:42-46. Erem C, Ozbas HM, Nuhoglu I, Deger O, Civan N, Ersoz HO. Comparison of effects of gliclazide, metformin and pioglitazone monotherapies on glycemic control and cardiovascular risk factors in patients with newly diagnosed uncontrolled type 2 diabetes mellitus. Exp Clin Endocrinol Diabetes. 2014;122:295-302. Derosa G, Bonaventura A, Bianchi L, Romano D, Fogari E, D'Angelo A, Maffioli P. Vildagliptin compared to glimepiride on post-prandial lipemia and on insulin resistance in type 2 diabetic patients. Metabolism. 2014;63:957-967. Pittas AG, Nelson J, Mitri J, Hillmann W, Garganta C, Nathan DM, et al. Plasma 25-hydroxyvitamin D and progression to diabetes in patients at risk for diabetes: An ancillary analysis in the Diabetes Prevention Program. Diabetes Care 2012. Petchey WG, Hickman IJ, Prins JB, Hawley CM, Johnson DW, Isbel NM, et al., Vitamin D does not improve the metabolic health of patients with chronic kidney disease stage 3-4: A randomized controlled trial. Nephrology (Carlton). 2013;18:26-35. Pfister R, Barnes D, Luben R, Forouhi NG, Bochud M, Khaw KT. No evidence for a causal link between uric acid and type 2 diabetes: A Mendelian randomization approach. Diabetologia. 2011;54:2561-2569. Sluijs I, Holmes MV, Van der Schouw YT, Beulens JW, Asselbergs FW, Huerta JM, et al., A Mendelian Randomization Study of Circulating Uric Acid and Type 2 Diabetes. Diabetes. 2015;64:3028-3036. Diallo D, Dubourg L, Ranchin B, Cochat P, Bacchetta J. Relationship between glomerular filtration rate, uric acid, and parathyroid hormone in children. Arch Pediatr. 2013;20:601-607. Bikle DD. Vitamin D metabolism, mechanism of action, and clinical applications. Chem Biol. 2014;21:319-329. Liang J, Pei Y, Gong Y, Liu XK, Dou LJ, Zou CY, et al., Serum uric acid and non-alcoholic fatty liver disease in non-hypertensive Chinese adults: The Cardiometabolic Risk in Chinese (CRC) study. Eur Rev Med Pharmacol Sci. 2015;19:305-311. Jia G, Di F, Wang Q, Shao J, Gao L, Wang L et al. Non-alcoholic fatty liver disease is a risk factor for the development of diabetic nephropathy in patients with type 2 diabetes mellitus. PLoS One. 2015;10:e0142808. Eliades M, Spyrou E. Vitamin D:A new player in non-alcoholic fatty liver disease? World J Gastroenterol. 2015;21:1718-1727. Hao YP, Ma XJ, Luo YQ, Ni J, Dou JX, Hu YQ, et al., Serum vitamin D is associated with non-alcoholic fatty liver disease in Chinese males with normal weight and liver enzymes. Acta Pharmacol Sin. 2014;35:1150-1156. Chen EQ, Shi Y, Tang H. New insight of vitamin D in chronic liver diseases. Hepatobiliary Pancreat Dis Int. 2014;13:580-585. Barchetta I, Carotti S, Labbadia G, Gentilucci UV, Muda AO, Angelico F, et al., Liver vitamin D receptor, CYP2R1, and CYP27A1 expression: A relationship with liver histology and vitamin D3 levels in patients with nonalcoholic steatohepatitis or hepatitis C virus. Hepatology. 2012;56:2180-2187. Sugimoto R, Watanabe H, Ikegami K, Enoki Y, Imafuku T, Sakaguchi Y, et al., Down-regulation of ABCG2, a urate exporter, by parathyroid hormone enhances urate accumulation in secondary hyperparathyroidism. Kidney Int. 2017;91:658-670. Takada T, Ichida K, Matsuo H, Nakayama A, Murakami K, Yamanashi Y, et al., ABCG2 dysfunction increases serum uric acid by decreased intestinal urate excretion. Nucleosides Nucleotides Nucleic Acids. 2014;33:275-281.